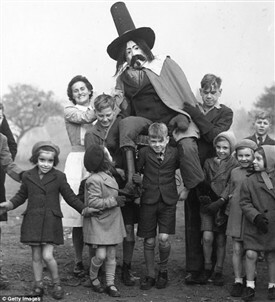 Guy Fawkes Night is an interesting custom, for despite being seen as being a popular as ever, it has perhaps over the years become slightly eroded and now the term "Bonfire Night" is more often used than "Guy Fawkes". However Nottinghamshire appears to have been a strong supporter of its celebration. There are records of similar bequests in the county, the most noted by a Thomas Charlton, of Chilwell, purchasing a Bramcoat close, called Ashflat, the profits of which would pay for a sermon in Attenborough Church. A further encouragement to attend would be the establishment of charity distributions. Doles for the poor at times when many literally lived ‘on the breadline’ were very welcome. One distributed in Arnold was bequested by a Henry Sherbrooke provided £3 per annum to be distributed in bread, whereas Christopher Sudbury’s Charity of Edwinstowe gave money. Indeed often extra payments were made to the bell ringers in Nottingham in 1747, a 2s and 6d were given to Nottingham for ‘Gunpowder Treason’ with 6d given for candles for ringers. In 1859 parliament rescinded the celebration of the 5th and with it many of the church observances became redundant. However, despite the apparent aim of the government to discourage the public observation, fearing it as a source of insurrection; private, and in some cases civic, observation continued. “On Bonfire Night, all the boys (girls too) came to the bonfire (on which there'd be a guy) with long poles, on the end of which were tightly bound rags, in flames and we'd set the fire going by thrusting the burning torches into it...Again, there was no penny-for-the-guy stuff, round our way anyway,"
These large informal street fires became a thing of the past when in the 1960s the police, local authorities and fire brigade combined to prevent them and in 1963, 27 organised sites were provided. In the 1990s regular sites were established in Beeston, Rainworth and Hucknall as well as Nottingham’s the Forest Ground with its additional fun fair described as a mini Goose fair. A visitor to this event, always held on the 5th, will still see, with its Guys, often made by local schools, and jubilant fireworks and fun fair, how this is a worthy descendent and memorial to the event. Beaumont, R. M., (1973) A Flash of Lightning on Guy Fawkes' night, 1711: The Fire at Southwell Minster', TTS 77, pp73-81. Burne, S. C., (1912) Guy Fawkes’ Day. Folk-Lore Vol XXIII. No. IV.December 1912. This page was added by R B Parish on 29/11/2012. Found in the Parish Constables accounts for East Leake, 1791 - "5th Nov paid for Ale Gunpowder plott"
In a diary written by a William Moss of Mansfield (who worked as a Cooper) is the following entry for 5 November 1841: "Gunpowder Plot; but I think it is almost forgotten at Mansfield. I have neither seen squib nor cracker, nor anything of the kind. 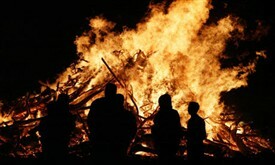 There is one bonfire at the top end of Stockwell Gate and I know not of any more in the town".